Not just a new year, but THE year! So this is it. 2009. The year I have been building up to for the past three years, the year of the Ocean. I visualise my years as square shaped (don’t ask!) – each side representing three months and we are now on that final corner looking straight at the row. How completely exciting. Slightly nerve-wracking too as I look at the list of things to do, the last bit of finance we need to secure, the kit that needs to be bought and packed, the appointments and meetings I have between now proposed lift-off date. Eek! Still, if it wasn’t challenging it wouldn’t be half as much fun or nearly as satisfying. I am just looking forward to getting out there now and starting rowing. And the sunshine too – can’t wait for the warmth. In a capsize drill yesterday on Rutland Water I got very chilly indeed – there’ll be sun tans and floppy hats on the ocean, no need for quite so many layers as there is at the moment. I hasten to add that the capsize drill failed. Failed in the best possible sense in that we couldn’t actually get Serendipity to roll at all – she did not want to go turtle and was adamant that we weren’t going to make her, no matter what we tried. Including lashing lines to a RIB (super-fast-big-engined speed boat) and driving off – she was having none of it. So I am very confident that she’s not going to capsize in a hurry when we’re out there and if she does, she’ll be rolling back round to default in a flash. With my rather inelegant fall into the water off the bows of the boat there was no option but to try the ‘Sarah gets back on board by herself’ drill too – bearing in mind I was wearing full sailing waterproofs and my by now inflated life jacket, I think it went rather well – so all is good. This month is going to be a bit of a monster – I’m driving ‘Dippers down to London for the Boat Show on Monday for two and a half weeks. 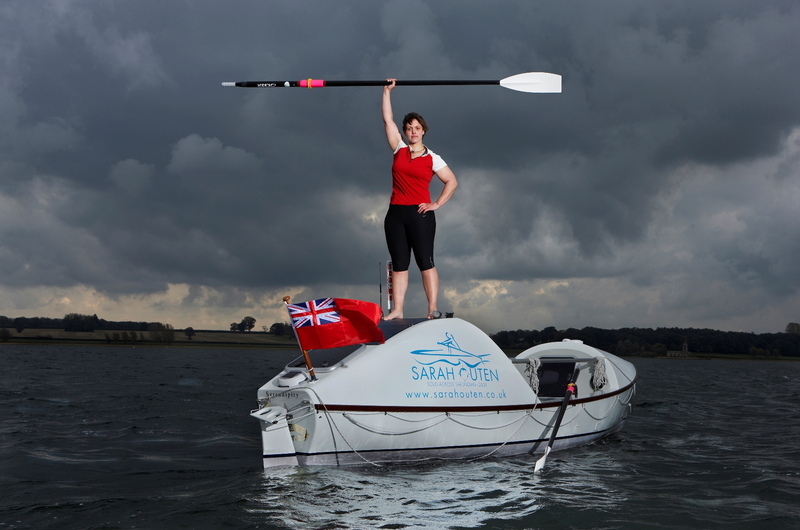 If you’re in the area on Wednesday 14th then pop along to the Main Stage at 1pm for my talk and launch, with one of my rowing gurus Sally Kettle. And you’ll have an opportunity to see the lovely ‘Dippers herself – in all her glory, now fully logo’d up as well. She’s looking very smart indeed. Then after that it’s my medical training up in Cumbria with Dr Sean Hudson of Expedition Medicine and finally to round off January I will be packing the boat up and driving her down South ready to be shipped to Oz. Happy days or what?! Meanwhile, here’s a shot from the day with Jude Edgington back in October. Also just below freezing that day! One Response to Not just a new year, but THE year!